In the intelligence-industrial complex, anonymity is merely a privilege for the powerful. It made sense that there were more people at Jeremy Hammond’s sentencing than his other court dates of the last 20 months, but I didn’t expect the West Point students. Three rows deep, the gray-uniformed cadets sat at attention. As far as field trips go, it had to be a memorable one; while Hammond’s role in hacking the private intelligence firm Stratfor had drawn considerable attention, this was Hammond’s first court appearance since Edward Snowden disclosed the NSA’s mass surveillance programs. The news of the past six months was inescapably in the air. It seemed appropriate to have one side of the courtroom (seated behind the prosecution) flanked with identically dressed people preparing to serve state power, and on the other (behind the defense) a diverse array of activists, journalists, and Hammond’s friends and family. This study in contrasts suggested a state overcompensating for its own hypocrisy. 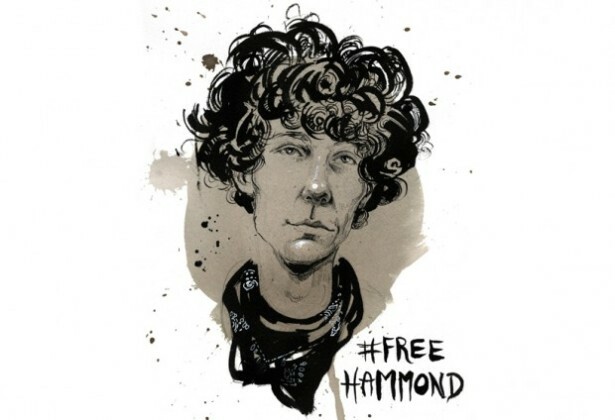 The show of force imposed in Hammond’s sentencing indicates just how troubled the surveillance state is by hacktivists like Hammond, and why the principles he lives by are more important than ever. Hammond was sentenced to the maximum of 10 years in prison for the Stratfor hacks, a maximum born of a plea agreement made this spring. The terms of his three-year probation following time served are notably harsh. During probation, all Hammond’s online activities are to be monitored. He is not allowed to disguise his identity online in any way, he will be forced to install — and pay for — monitoring software on his computer, and he will not be allowed to encrypt any of his online or offline data. In the intelligence-industrial complex, anonymity is merely a privilege for the powerful. Firms like Stratfor can monitor activists with no obligation of disclosure. The state, too, can act with anonymity, redacting FOIA-ed documents until they resemble Malevich paintings. Surveillance is driven by this asymmetrical power dynamic. In the eyes of the court, Jeremy Hammond no longer deserves anonymity because of his efforts to expose Stratfor and challenge that dynamic. Although the court asked to have information about specific targets redacted, a pastebin of Hammond’s unredacted statement, confirmed as legitimate by security researcher Jacob Applebaum, suggests that throughout Sabu’s activities as an informant, Hammond and other hackers were used in a perverse twist on the public-private partnerships so common to the intelligence-industrial complex; as the hackers infiltrated the servers of other countries’ governments, U.S. agents gathered what they found for their own intelligence. The FBI’s apparent complicity with the hacks is indicative of the power structure beneath it, one described by Hammond as one that “does not respect its own system of checks and balances, never mind the rights of its own citizens or the international community.” Hammond himself strikes a dramatic contrast to that system of power, described repeatedly in the 265 letters of support written for his case as a committed and compassionate activist. I keep thinking about the West Point students who were there to learn how the law works — or, at least, who the law works for. Through the entirety of the proceedings, I didn’t see a single one of them taking notes. Perhaps they have extremely good memory retention. I would love to ask them what they saw happen in that courtroom, though I suspect I would be further demoralized by their interpretation. To despair at the sentence, however, is a betrayal of the principles that led Hammond to this point. He has consistently contextualized his actions and his imprisonment in a larger struggle — against the prison system, against racism, against corporate hegemony and for a better world. If there is anything to be done in the aftermath of this case, it is to take Hammond’s final words of his courtroom statement to heart: “Stay strong and keep struggling” — and, if you can, stay anonymous.